Welcome to this spooky edition of Becca’s Hype! This week I delve into the latest scary announcements from Twitter and Facebook regarding transparency. Think back to this spooktacular time last year, and you’ll remember all of the buzz online and in the media surrounding the 2016 US Presidential Election. Great memories, right? There has been much criticism surrounding ads with political intent which were run at that time, and this has promoted Twitter to release a new Transparency Centre to share the details of ads running on the platform, with advertisers on the network. Ads targeted to you alongside personalised information on which ads you’re eligible to receive. Twitter will also be highlighting political ads to users. From now on, ‘electioneering’ ads, (political ads) will be clearly identified with a purple political ad indicator. This is similar to a verified checkmark which you’ll be used to seeing on the platform. 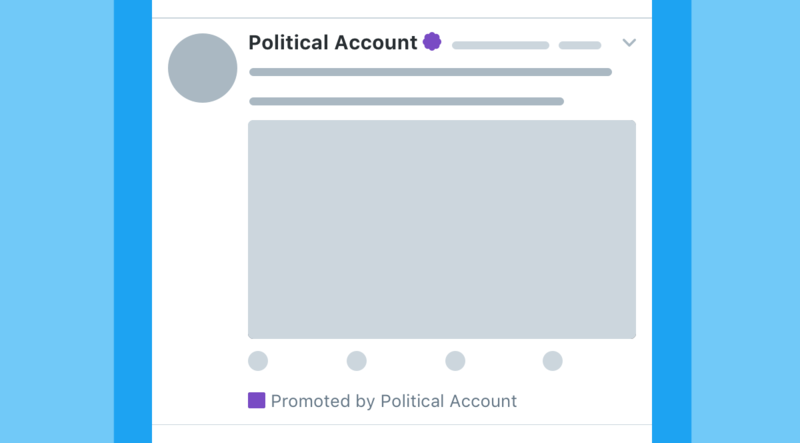 Here’s how political ads are going to be displayed on Twitter. These political ads will have a dedicated section within the Transparency Centre, where you’ll be able to see further insights about the ads, such as who the organisation behind the ad is, which demographics have been targeted and more. Take a look at exactly what you’ll be able to find out in Twitter’s blog post. As always with most significant updates like this, the Transparency Centre is being released first in the US and will roll out globally soon after. I’m also eager to see if users who are not advertising on the network will be given access to see all these advertiser insights. Just because you’re not running ads yourself doesn’t mean you shouldn’t be able to see the targeting & organisations behind them. Facebook have also released an update to their transparency policy, and there’s also focuses heavily on ads which could be running during the lead up to elections. In an upcoming update, you’ll be able to click on a button called ‘View Ads’ on any Facebook page you’re visiting, and see all the ads that page is running across Facebook, Instagram and Messenger. You’ll be able to see the ads whether or not they’re targeted to you. This update is being rolled out to Canada first and then should be rolled out to the US in time for midterm elections, and other countries around the globe. (Facebook haven’t been very specific about this, just saying ‘around the same time). To begin with, Facebook will only show active ads currently running, however once the initial testing is complete, they plan on keeping an archive of political ads, allowing users to compare between past and present. I would  it if Facebook was able to give us some historical data on how much money was spent by each US candidate in the 2016 Election, and just how many people were reached. Fingers crossed they’ll release this data at some point in the future, so we can properly understand how much a Facebook ad can influence someone’s decision. Facebook are going to enforce verification of identity when running political ads, especially during the lead up to elections. Advertisers will have to have both their identity and location verified, hopefully decreasing the number of ads coming from other countries about about ongoing elections. This is especially interesting considering that earlier in the year, Facebook disclosed that $100,000 had been spent leading up to the election on ads from Russian-affiliated accounts. Perhaps the introduction of these ads insights we’re just left with a haunting memory of what happened in 2016, and won’t have to go through it again. I’m happy to see that Facebook are putting such an emphasis on political ads, as it shows they are accepting of the idea that Facebook really can influence people in their decision of who to vote for, something that Mark Zuckerberg disagreed with this time last year, saying that “Voters make decisions based on their lived experience”. Do they Mark, do they? Only time will tell if these efforts made by Twitter and Facebook are going to be effective in future campaigns, but I for one cannot wait until the updates roll out to the UK so I can get my hands on some data surrounding Facebook campaigns. That’s all for today, have a fang-tastic week and be sure to visit again next week for the latest social media news!